70th Birthday Salute to the Naval Service: – Paper Never Refused Ink! Cogadh na Saoirse: Ar Muir is ar Tír. Nuestra Senora de Gardtoza, January 30th 1990. Cobh -The Gateway to Munster. Ship Shape and Ready for Action. Life after the Defence Forces. Faces of Resistance – Opposing the Nazis. Reproduced here with the kind permission of the Editor of An Cosantóir, this is my Article which featured in the Dec 2016 edition. On the 1st of September 2016, the Naval Service slipped into its seventieth year and went about its duties with the same quiet professionalism that it has always had and hopefully always will. 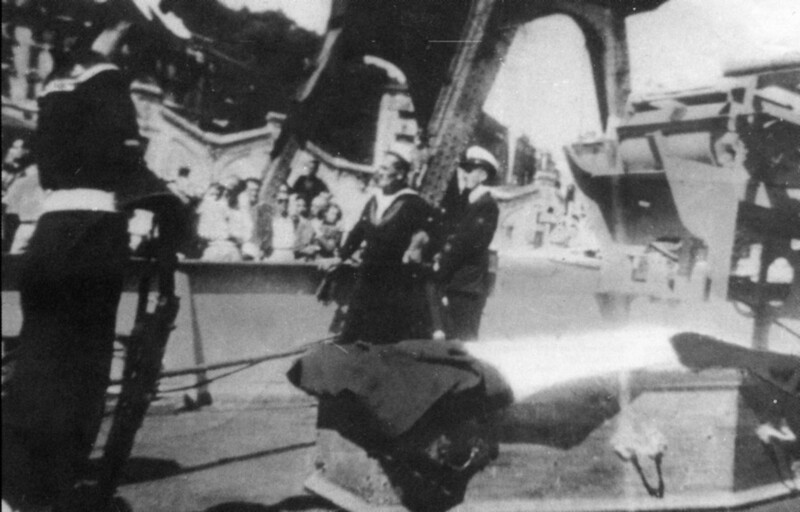 The crews of the modern navy who have acquitted themselves so well off the coast of Libya are following in the footsteps of those who laid the foundations of the Service in September 1946. The Naval Service is the principal sea going agency of the State and performs a whole host of duties for the government and other stakeholders. 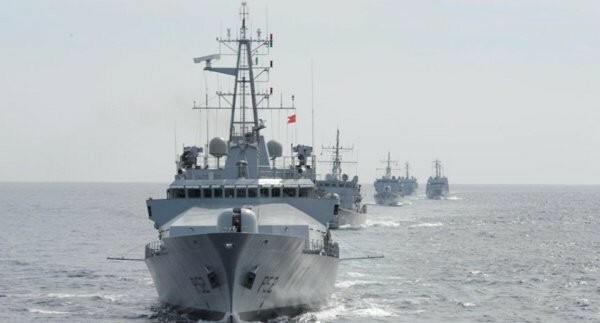 Fisheries protection in Irelands Exclusive Economic Zone, narcotics & arms interdiction, search & rescue; these are only some of the tasks which they can be called upon to perform at any time during Maritime Defence and Security Patrols. In projecting the law of the State beyond the horizon, they defend Irelands interests with their presence and as self-contained mobile units they are capable of undertaking tasks which no other state agency can perform. 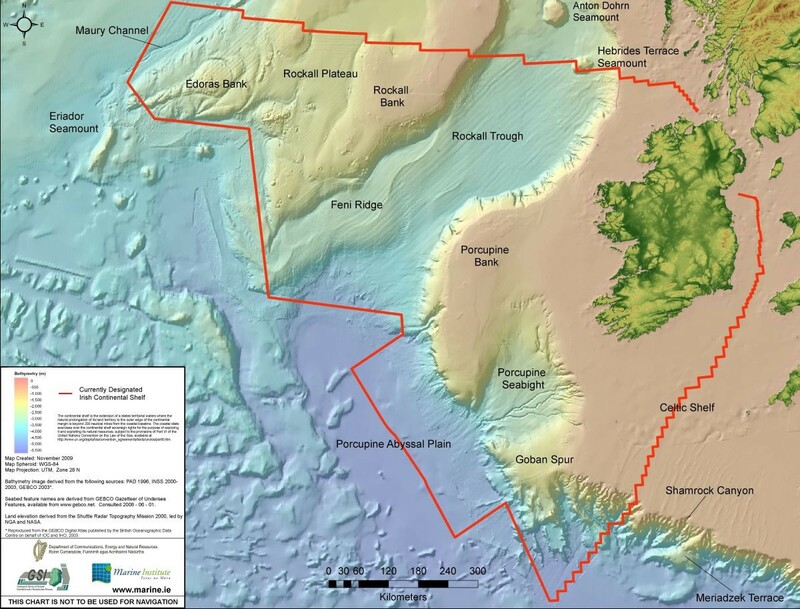 The real map of Ireland, stretching far out to west into the deep waters of the Atlantic. The Anglo-Irish treaty of 1921 gave the Irish Free State responsibility to police its customs and fisheries while the UK remained in control of Irish Waters. In particular the UK retained all powers in relation to maritime defence and retained the Treaty ports of Swilly, Cork and Berehaven. There was a maritime element to the Civil War however, the reality is that from the end of the Civil war in 1923, Ireland possessed no naval force. The Coastal and Marine Service was created in that year but only one year later, it was disbanded. In 1938 the Treaty ports as they were known, where handed back to the state. In 1939 the Marine and Coastwatching Service was founded and they regulated merchant ships and protected fisheries of the coast using their six motor torpedo boats and some other vessels. In 1942 this was renamed the Marine Service. Currently, there is an authorised strength of 1094 sailors both commissioned and enlisted personnel based in Haulbowline Island in Cork Harbour. From this home on “Inis Sionnach”, the eight ships of the Naval Flotilla depart on their Maritime Defence and Security Patrols. Yet the Naval Service founded in 1946 traces some of its traditions to the earlier formations. The fledgling service required vessels to form the core of a permanent naval force which was needed to protect Irish sovereignty. This led to the purchase of three Corvettes from the United Kingdom and they were named the LÉ CLIONA, LÉ MAEV and LÉ MACHA. 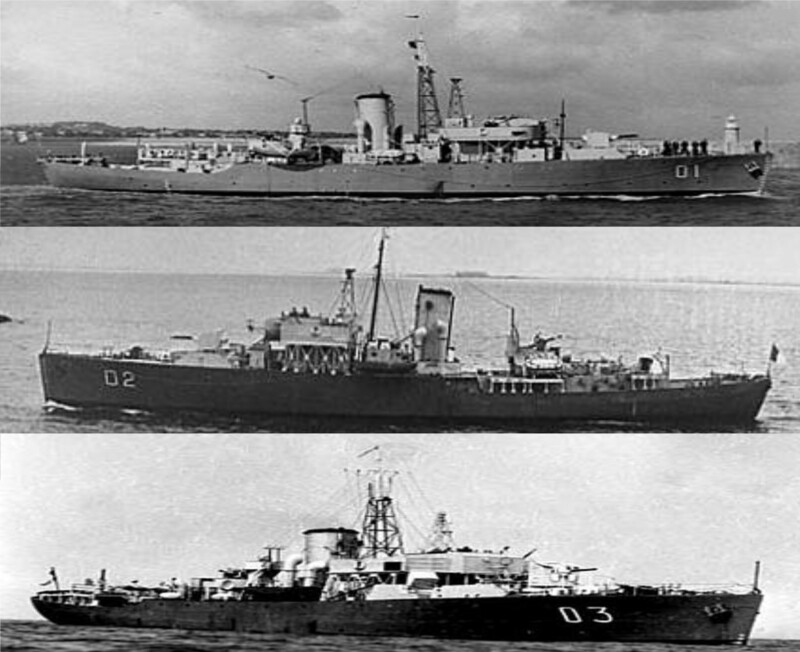 These corvettes, served the state faithfully until the lowest ebb of the service was reached in 1970 when two were scrapped and LÉ MAEV alone constituted the extent of our naval forces. For some unknown reason, Ireland has always suffered from a degree of some form of “sea blindness” and this led to a shameful neglect, which has thankfully had no parallel since. LÉ MAEV was withdrawn from service in 1972 and three mine sweepers LÉs GRÁINNE, BANBA and FÓLA were duly purchased and commissioned. The minesweepers kept the Service going until it entered the patrol vessel era. The patrol vessels were built in Ireland to an Irish design for Irish waters and were a real leap forward. To keep these vessels at sea requires all the many different trades, specialist technicians, logisticians and civilian dockyard craftsmen working often in what seems to be organised chaos. It requires schools and colleges which instruct and educate the generations of sailors in the arts of seamanship which are still as much a part of working sailors routine today as they were seventy years ago. The basic core mariner is produced by the Naval College where civilians are transformed into sailors with all the skills required to be a disciplined, functional and adaptive force. The Naval College and its partner, the National Maritime College is where NCOs are forged, both by training in leadership and by their own individual specialist training, into young leaders who are at the forefront of the professionalism that allows the Naval Service to perform at the level it does. A class of Direct Entry Engine Room Artificers take aim at new careers while undergoing their ceremonial drill display. The Naval Service has always produced strong independent NCOs, due in no small part to nature of their work at sea where it is often necessary to instantly react to save life or limb without reference to higher authority, relying first on their own experience and training. The commissioned ranks have also produced a tradition of highly capable officers, who have led the service from the horrendous days of only one sea going vessel, to exciting days of the production of Irish built ships and forward into the modern era. The main direction of that modern leadership has been provided by the current Chief of Staff, Vice Admiral Mark Mellett DSM, who as then Commodore and Flag Officer Commanding the Naval Service clearly articulated what the Naval Service could do and would do at every opportunity. He led the way in the foundation of the National Maritime College of Ireland in Ringaskiddy, currently the only joint military and civilian third level institution in the State. This recognition of the Naval Service as an able and willing partner has allowed the Naval Service to become a platform of innovation and in the years to come with the Irish Maritime Energy Research Cluster (IMERC) being based so close to Haulbowline, it will surely benefit both the State and the Service. The current Flag Officer Commanding the Naval Service is Commodore Hugh Tully and it is he that has so successfully guided the service through the last number of years. He had overseen much needed major works on the ships, ensuring that the outputs of the service where maintained as far as possible. 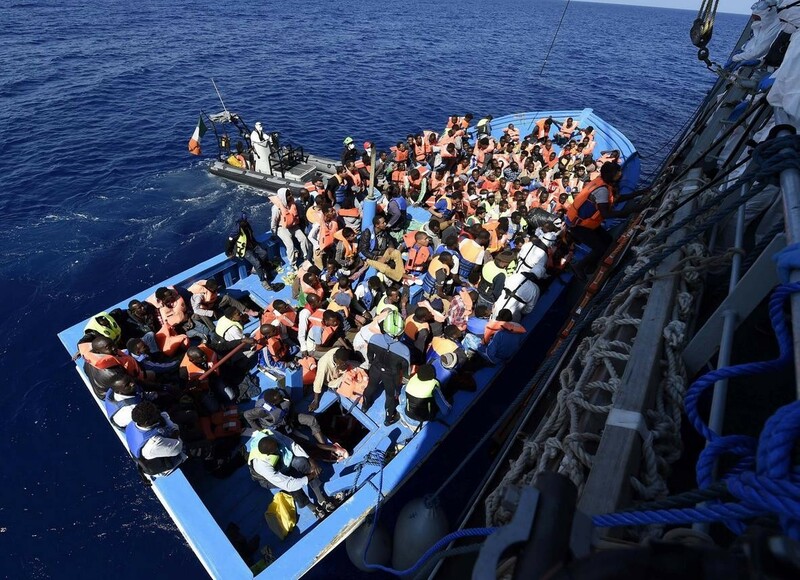 All the while he must control the ever-increasing operational tempo of the Naval Service, in particular the difficult and dangerous rescue operations in the southern Mediterranean. The modern Naval Service is equipped with state of the art vessels yet still operational is the final remaining Irish built ship from 1984. LÉ EITHNE reaches her 36th birthday this December. Manufactured in the Velrome Dockyard in Cobh, she proved so useful when Ireland committed its Naval Service to render aid to our European partner Italy in May 2015. The other vessels still in service are LÉ ORLA & LÉ CIARA, these coastal patrol vessels provide the Service with an unrivalled inshore capability. With their high speed and manoeuvrability they are a formidable asset. The LÉ RÓISÍN and LÉ NIAMH are now in their middle life, since 2000 and 2001 they have proven to be exceptional ships and their basic layout and design forms the core part of the newer larger vessels that came after them. They have a balance of size, speed, armaments and crew accommodation that was unmatched when they first hove into view in the lower harbour from Appledore Shipyard in Devon, UK. where they were built. 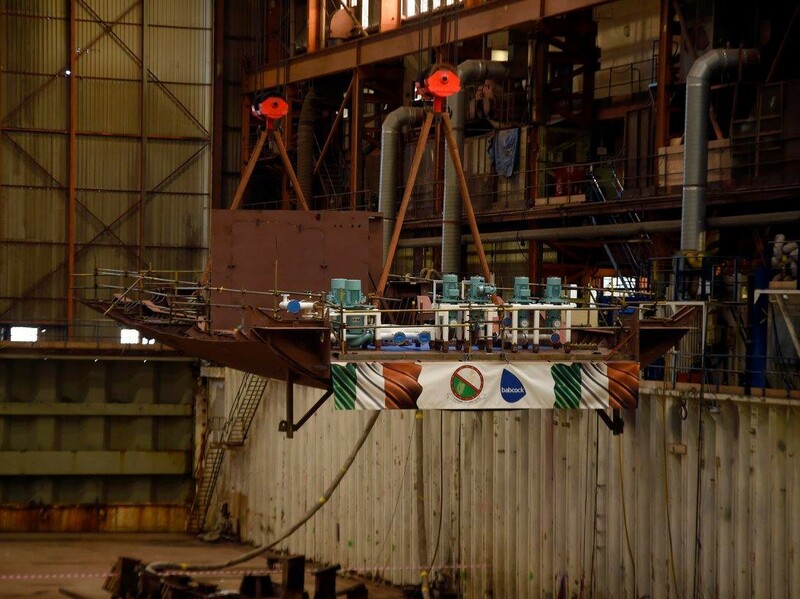 It is in Appledore that the patrol vessels LÉ WILLIAM BUTLER YEATS, LÉ SAMUEL BECKETT and LÉ JAMES JOYCE have been produced and a fourth “Writer Class” vessel is being cut from steel, welded into sections and assembled in the fabrication yards. The fourth Offshore Patrol Vessel (OPV) for the Irish Naval Service will bear the name of renowned Irish playwright George Bernard Shaw maintaining the approach of naming this class of vessel after Irish literary greats. The announcement was made during a traditional Keel Laying Ceremony, to mark a significant milestone being reached in the build process for the fourth new OPV, in Babcock’s Shipbuilding Yard in Devon, UK on the 28th of February 2017. The first fabricated section of the keel of P64 is lifted into the dock bottom. The Keel Laying ceremony was attended by the Minister with Responsibility for Defence, Mr. Paul Kehoe TD, senior representatives from Babcock, the Defence Forces and the Department of Defence, as well as Naval Service members involved in the build project. Speaking at the ceremony Minister said “Whether it is carrying out defence and security operations, on sea fisheries patrols, search and rescue operations or on overseas missions such as the humanitarian operation in the Mediterranean, the efforts of the Naval Service are enhanced by having access to new vessels equipped with the latest available capabilities. Over the years the Service have been involved in many high-profile operations. In 1948, the Service was given the task of returning home the remains of the Nobel prize-winning poet WB Yeats who had died in France in 1939. LÉ MACHA was dispatched to bring the poets remains home to rest “under bare Ben Bulbens head”. 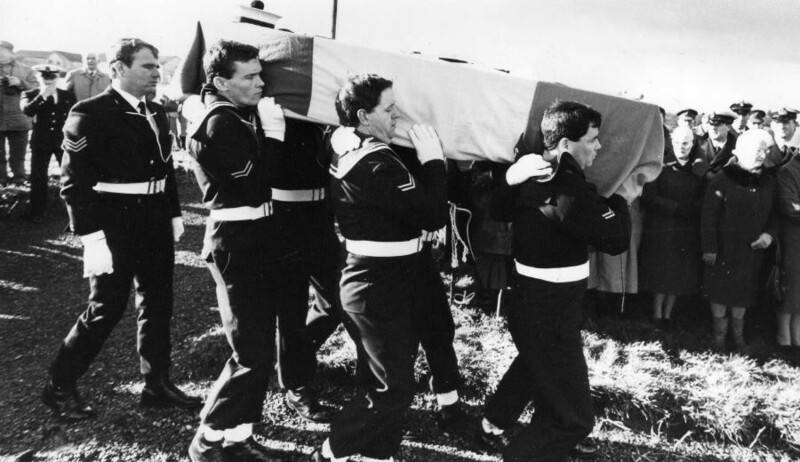 LÉ Macha with the coffin of WB Yeats ( on the right is L/S Maurice Ahern and P/O Bill Berminghan). Please take a few minutes to view a unique video of the removal of the remains of WB Yeats. When the Northern Troubles were at their height, the Naval Service was at forefront of the interception of arms and munitions destined for the Provisional IRA. The death and destruction prevented by the foiling of these importations cannot be calculated. The ‘MV Claudia’ in March 1973 was sailing from Cyprus to Helvick head, having stopped off the coast of Tunis to embark a cargo of arms supplied by the Libyan dictator Col Muammar Gadaffi. It was stopped prior to its rendezvous by the LÉ FOLA, LÉ DEIRDRE and LÉ GRAINNE. Again, in September 1984 the LÉ EMER and the LÉ AISLING intercepted the fishing vessel ‘Marita Ann’, that faithful night the Service prevented seven tons of explosives, arms and ammunition from reaching the horrendous conflict inflicted upon the people of Ireland. Air India Flight 182, on the 23rd of June 1985 will long be remembered as a most terrible event. A bomb exploded within the Boeing 747-273B and it disintegrated at a height of 9,400 metres above the coast of Cork. A terrible act of mass murder that resulted in the death of all 329 passengers and crew. The LÉ AISLING was tasked as on-scene commander in the area of the disaster and over the course of the operation they toiled in shark-infested waters and four of the ship’s company were awarded Distinguished Service Medals for their actions, LtCdr James Robinson, PO/SEA Muiris Mahon, L/SEA John McGrath and A/SEA Terry Browne. 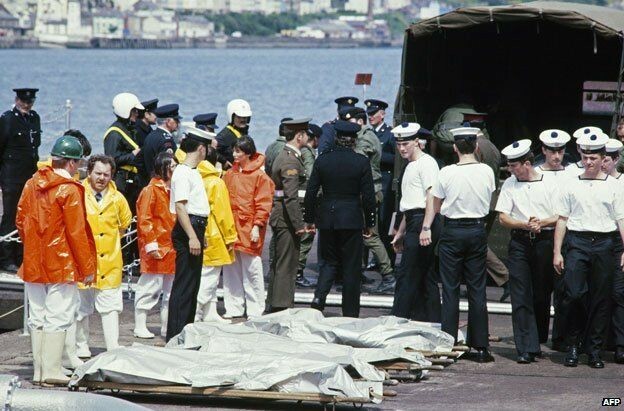 A terrible sight of the innocent during the recovery operation for Flight 182. The Aer Corps have a motto ‘Go Mairidis Beo’ its accepted translation is ‘So others may live’ which echos the US Air Force Pararescue motto. It stands a statement of commitment from the people who will place the lives of others above their own. It also is very apt to apply it to Irish sailors who in all weathers will put to sea in small RHIBs, against the fury of the ocean and into the face of the storm to save their fellow mariners who are in peril on the sea. On the night of the 30th of January 1990 the LE DEIRDRE was at anchor in Lawrence’s Cove in the shelter of Bere Island from severe gale force winds. A terrible drama was unfolding close by, the Spanish fishing vessel, Nuestra Senora de Gardtoza, (Our Lady of Gardtoza) had run aground on rocks near Roancarrigmore Light, north east of Bere Island in Bantry Bay. She was taking water and she had 16 souls onboard. LÉ Deirdre received the ‘MAYDAY’ at 2100hrs and as quickly as she could the crew weighed anchor and headed out of the shelter into the severe gale towards the distressed vessel. The decision was taken to launch the ships Gemini to attempt a rescue, this was due to no helicopter support being available and there no way to manoeuvre LÉ DEIRDRE in close to vessel due to the weather. 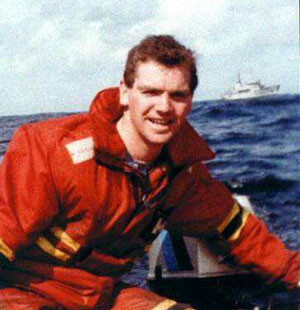 Leading Seaman Michael Quinn, a native of Drogheda along with Able Seaman Paul Kellett from Dublin volunteered to crew the Gemini as boat coxswain & bowman respectively. The highly experienced seamen still committed knowing the risks in the face of the horrendous conditions. Once the Gemini manoeuvred close enough to the ‘Gardtoza’ it quickly became apparent that boarding the stricken vessel or a rescue would not be possible. Unable to board L/Sea Quinn took the decision to return to his vessel, disaster struck. The wind & waves capsized the small boat and cast both sailors into the churning waters. The brave comrades were separated in the darkness and an exhausted A/Sea Kellett was washed ashore on Rocks near Dereen cove. Only concerned with rasing the alarm and finding his crewmate, he pushed himself through the barrier of utter exhaustion, clambered up over the jagged rocks as they tore flesh from his naked feet until he managed to reach the main road. A passing Garda patrol picked him up and he passed the message that L/Sea Quinn was lost out there in the blackness. There were soon two operations underway an RAF Sea King Helicopter arrived to successfully rescue the crew of the Gardtoza and a number of merchant vessels joined LÉ DEIRDRE in searching for L/Sea Quinn. Sadly the next morning an Air Corps Dauphin helicopter, at 0800hrs on the 31st it recovered the body of Leading Seaman Quinn, 3 miles east of the tragic scene. Borne by comrades, L/Sea Quinn DSM is laid to rest with full military honours. L/Sea Quinn was only 27 at the time of his death and the survivor A/Sea Kellet was only 21. Their courage and their commitment to the each other, the naval service and the nation is an example of the spirit of Óglaigh na hÉireann, which shone as brightly in these two young men as it has ever shone in any patriot. 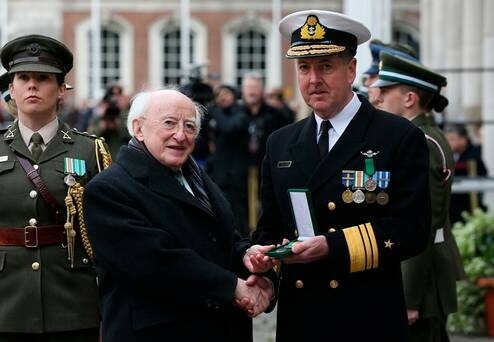 In recognition of his unselfish bravery and devotion to duty the Distinguished Service Medal was posthumously awarded to L/Sea Quinn. The King of Spain also made a posthumous award of the Spanish Cross of Naval Merit in recognition of his brave attempts to rescue the Spanish crew. A/Sea Kellett was also awarded both medals in equal recognition of his bravery and dedication to duty. Ireland’s position on the west coast of Europe has made her an attractive destination for international and domestic drug smugglers. There have been huge successes, ‘Operation Seabight’ in 2008 when an estimated €675 million worth of Colombian cocaine was seized from a 60-foot sloop, ‘Dances With Waves’ off the Cork coast. This was an international operation where the Maritime Interdiction teams of LÉ RÓISÍN and LÉ NIAMH where the tip of the sword. Again, in September 2014 a huge inter-agency operation was conducted using the LÉ RÓISÍN and LÉ NIAMH at night and in challenging conditions 250 miles west south-west of Mizen head, the yacht ‘The Makayabella’ was apprehended. 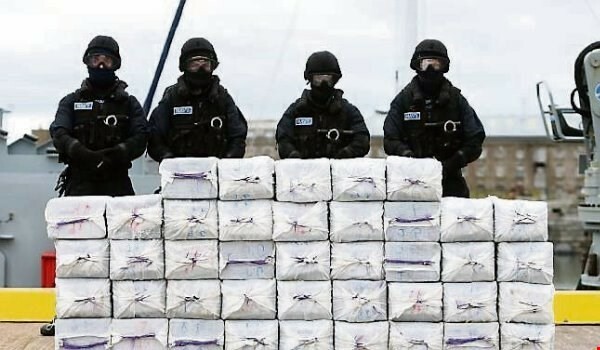 Maritime Interdiction Team members stand behind nearly 1 tonne of Cocaine. The trial judge described the €350 million haul as “colossal” and “mind boggling” when he sentenced the crew to 73 years in total for their part in the smuggling. No review of the 70 years of the Naval Service could be written without describing the deployments of the Naval Service vessels in the Mediterranean. Italy was dealing with the migrant crisis nearly alone and fatalities were mounting as desperate people displaced by wars or conflicts which had erupted in many nations in the Middle East over 2013 & 2014 sought refuge outside of their homelands. Also, vast numbers of people displaced by poor economic conditions attempted the journey across the sea from Libya in unseaworthy craft of all descriptions. The LÉ EITHNE was the first to depart in May 2015 and she forged the trail that LÉ NIAMH and LÉ SAMUEL BECKETT followed over the course of the year, pausing as the winter weather closed in. LÉ Eithne pictured during the embarkation of rescuees off the Libyan Coast. In 2016 Ireland yet again answered the call and dispatched the LÉ RÓISÍN in the spring, LÉ WILLIAM BUTLER YEATS over the summer and currently the LÉ SAMUEL BECKETT is mid-way through its second deployment. The missions are complex and dangerous, not just recovery panicking persons from sinking craft but the traumatic task of recovering deceased persons from dark & cramped bilges. 14,648 individuals have been rescued from the sea at the time of writing and tragically 72 deceased persons have been recovered as well. Working in harsh environmental conditions and bearing witness to human suffering normally only associated with the most vicious of conflicts, these men and women of the Naval Service have completed all tasks assigned to them and the manner in which they have performed their harrowing duties, has been in keeping with the finest traditions of the service and of Óglaigh na hÉireann. Casting our eye back over the Navy’s seventy years, we see a service that has completed all the tasks assigned to it with the resources they had to hand during whatever era you chose to look at. 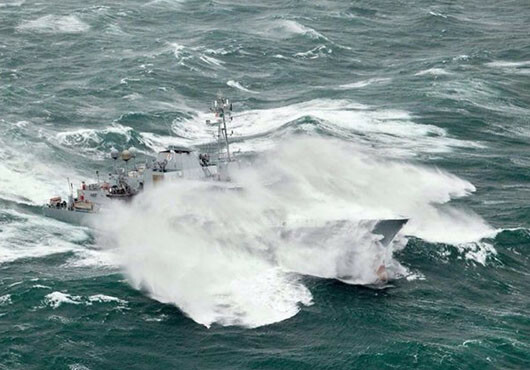 The Irish Naval Service is adaptable, capable and responsive. As we move forward into the uncharted waters of the future who knows what challenges our nation will face? We can, however, say a few things with certainty. The quiet professionals of the Naval Service will tend their ships, they will slip and proceed down the Cobh roads, out past Roches point and there over the horizon, far from sight, they will carry out our Nations work, a physical expression of our sovereign state in the unforgiving waters of the North Atlantic. Lá breithe shona duit, tSeirbhís Chabhlaigh. Previous Post Life after the Defence Forces. Ruairí de Barra on Something in the Water. Stephen McCarthy on Something in the Water. peterwalsh999 on Something in the Water.